A former student sent me an E-mail recently and updated me on his progress and his current research project – the history of British banking in the 19th century. He also wanted to draw my “attention to a little known period in British Economic history that seems to reinforce the interrelationship between fiat currencies, public debt and expenditure and rates of economic growth and unemployment”. So square centre of my own research interests (among others). So I did some further digging and read back through the notes I have taken over the last 35 years as a researcher. I was aware of the Bank Restriction Act 1797 “was an Act of the Parliament of Great Britain … which removed the requirement for the Bank of England to convert banknotes into gold.” This essentially created a fiat currency system with the central bank as the currency issuer. More interesting things arise as you dig further. For a period of 24 years, Britain lived under this form of monetary system. And, need I add, during this period Britain usurped the Netherlands as the most developed economy in the world at that point in history and the industrial revolution boomed. The mainstream economists of today would have predicted catastrophic results from the 1797 Bank Act. But then we know that what they say has zero credibility anyway. As an aside, I have been immersed in C18th Britain recently, quite apart from the topic I am writing about today. I have been reading the trilogy by John Prebble on the highland clearances and the genocide against the Scottish highland clans by the British redcoats. The trilogy starts with the Battle of Culloden in 1745, which effectively ended the Jacobite rebellion and began the genocide. The second in the series, published in 1963, The Highland Clearances provides a more detailed account of the depopulation of the highlands and the way the crofters were forced from their lands. The third book, Glencoe (published in 1966) goes back to the Massacre of Glencoe in 1692 when the British soldiers conspired with the Campbell Clan to murder the Donald Clan (who were based in Glencoe). This was a remote area in the western highlands. The British wanted to destroy the political power held by the Roman Catholic Macdonalds to undermine the Stuart claims to the throne. A scene in Game of the Thrones – the ‘Red Wedding’ – was a rip-off of this incident. As a result I have been reading a lot of papers discussing that era to get a picture of the economic conditions of the time. This research is also in relation to research I am doing as part of the Modern Monetary Theory (MMT) volume I am in the process of completing for Edward Elgar, which traces the intellectual history of MMT. Prebble has been highly criticised for his sympathetic rendering of the highlanders. The mainstream-type economists claim that the clearances of the highlands in Scotland were really driven by economic factors – declining fortunes, opening up of cities etc. They, of course, try to sanitise the slaughter and theft that the British monarchy and government inflicted on the highland clans to wipe out the Papist influence and bring the Scots to heel. So I have had my head in this period for some time now. And the E-mail from my former student provoked further more specific research of the period between 1793 and 1821. Recall that the Bank of England was created in 1694 as a private corporation as part of a strategy to restore credibility and function to national finances, which had deteriorated during the reign of the Stuarts. It was modelled on the Dutch Wisselbank, a national bank that provided the Dutch government with low cost and reliable funding. The Royal Charter was given to the Bank of England in 1694 and it became the government’s banker providing it with cheap loans and debt management capacities. In addition, the Bank began to take deposits and issue ‘banknotes’ to provide a record of the deposits, which were nothing more than promissory notes – a negotiable instrument issued by a bank and payable to the bearer on demand. Importantly, the Bank provided convertibility of these notes into gold. The Royal Charter, which established the unique relationship between the Bank and the Government, however, gave people confidence and the financial system was stable. London had become in a great degree the centre of commerce for the whole world, while the e Bank of England was the business centre of London. But the Bank had a double sphere of usefulness. As a private corporation, it exercised, not less by the high character of its directors than by the amount of its capital and the privileges of its charter, a great influence over all foreign and domestic trade. By common agreement, its notes circulated within London to the exclusion of all other bank-paper. Its discounts represented at that time a far greater proportion of the active capital of England than they now do. But its operations were not restricted within the limits of ordinary banking ; it was also a recognized official agent. As a national establishment, it issued the coin, managed the debt, took charge of government deposits, and made advances to the Exchequer and the Treasury, on security of Exchequer Bills. In the same capacity, it was expected to perform the difficult duty of maintaining a supply of gold, not merely for circulation, but in anticipation of any sudden drain or panic, which might cause a run upon the other banking institutions of the country. It was obliged, therefore, to purchase at a fixed rate all the gold which was brought to its counters. Thus, as a bank of discount, it held the exclusive privilege of discounting government paper; as a bank of deposit, it alone held the public balances; as a bank of issue, its circulation alone passed through the hands of the government as well as of the public. Its notes, when not issued in loans on Exchequer Bills to the government, or in payment for the precious metals as already mentioned, could only pass into circulation through the medium of discounts furnished to merchants. In 1697, the Government bestowed monopoly status on the Bank for note-issuance and bond trading within London. The rise of the South Sea Company challenged that monopoly in the early C18th, but collapsed before that challenge could really materialise. There was a significant number of other banks of issue in regional areas. broke out in 1792” and were separated (perhaps) by the Treaty of Amiens in 1802. This is contested but the point is that Britain had maintained a claim to the French throne for centuries and this led to renewed military conflict between Britain (as part of the so-called First Coalition) and France escalated in 1792, when France declared war on Austria. Britain joined the effort immediately. The importance of this escalation is that the British government had increased spending demands to prosecute the military effort. It was expensive keeping an army on the road and abroad (the Brits had laid siege to Toulon and supported French Royalist soldiers in their failed attempt at restoring the monarchy. Britain also supported the expenses of its coalition partners, having only a small army itself. The British government under William Pitt the Younger had engaged in widespread taxation reform to contain the national debt (and reduce interest payments) but this was insufficient to keep up with the spending demands of the war effort. To cover the fiscal deficit, the Government began to issue an increasing supply of paper notes, which required the Bank of England to convert into gold on demand (so-called ‘specie payments’, which also included silver coins). These notes were held by British and foreign-holders (given that resources had to be procured abroad) and the demand for convertibility increased rapidly. The 1867 article referred to above, describes the structure of banking in Britain in the late C18th. There were about 350 local (country) banks, which merchants “usually found it convenient to deal through”. As “banks of issue … they were always liable to be called upon to redeem their notes either in gold, in Bank of England notes, or in bills of exchange drawn on London” (a reference to the London money-market). The Bank of England exercised some control over the creation of credit (banknote issue) “as the head and heart of English credit; it exercised a controlling influence even upon the remote provincial trader” by “contracting its issues”. It also regulated “its discounts by raising or lowering its rate according to the value of money in the open market”. By 1795, the Bank’s gold reserves were in short supply, partly as a result of “a drain of builion to the Continent” as part of the War effort. In 1795, the Bank began experiencing a significant drain on its bullion reserve due to the government’s need for gold to finance the war with France and also to pay for imported grain after a succession of bad harvests. [Reference: Crosby, M. (2016) ‘The Bank Restriction Act (1797) and Banknote Forgery’, BRANCH – LINK]. The conservative response of the Bank of England was to engage in a contractionary policy approach (reducing the outstanding stock of banknotes) because with less gold stocks, the banknotes on issue were reduced in value (inflation). As the 1867 article documented, the Bank also had “to resort to the extraordinary measure of contracting their issues by rejecting a certain pro portion of the applications made upon them for discounts, without regard to the credit of the applicants”. Over the next two years, the Bank shrunk the circulation of its banknotes in line with the declining supply of gold. At the same time, the Pitt Government was demanding more gold from the Bank to prosecute the war. The Bank records are filled with repeated remonstrances addressed to Mr. Pitt on this account, and these, in February, 1796, were carried to the extent of an absolute refusal to discharge the bills drawn; while again, in July of the same year, a similar refusal was only overcome by the positive assurance of Mr. Pitt that it would be impossible to avoid the most serious and distressing embarrassments to the public service, unless an advance to the extent of £800,000 were made. The Bank yielded, but only under the strongest protest, declaring that nothing but the extreme pressure and exigency of the case could in any shape justify the directors in acceding. Whether this source of difficulty was due to bad management on the part of Mr. Pitt, or whether he had no choice but to lean upon the Bank, is of little consequence. History records that the by early 1797, the Bank was able to bring the situation under some control. But then there was a panic in Britain, ostensibly provoked by the fear of French invasion in February 1797. The so-called Battle of Fishguard (February 22-25, 1797), refers to the fight that followed the invasion by 1,400 French troops (La Legion Noire) at the tiny town in Western Wales. Panic set in and “caused a run upon the banks of Newcastle, and obliged them to suspend payment” (on their outstanding bills). The “panic spread in all directions” and there was demand from the local (country) banks on the Bank of England for “assistance of gold”. The Bank responded by further contracting its note issue, which made matters worse. [Note quotes in this blog are attributable consecutively to the last cited source]. These runs prompted other provincial banks to suspend specie payments and to request monetary support from the Bank of England. The growing climate of calamity saw demand for the Bank of England notes rise “exponentially, as they were still convertible to specie”. The Bank of England was forced to suspend convertibility on February 27, 1797 – the 1867 article writes that “an Order of Council … was posted on the doors of the Bank, forbidding further payments in cash”. A major financial collapse was imminent in Britain as people were rapidly losing faith in the veracity of the currency. The Government responded by talking up the Bank’s capacities and indicating that the suspension of convertibility was to be a short-term measure. Mr. Pitt declared that the affairs of the Bank were in the most affluent and flourishing condition, and that the restriction was only a precautionary government measure, which in a few weeks would be removed, he established, unconsciously as we must believe, a legal fiction of some value. Parliament never recognized any incapacity on the part of the Bank to meet its obligations, but only a temporary restriction, created by itself, and limited by law to a certain period. There was at least a delicate distinction favorable to national pride and private credit involved in this idea that there was no actual bankruptcy in the case, but that the government had seen fit, for the public convenience, to relieve the Bank for a time from a duty which it was still ready and able to perform. The Government also organised a meeting at the Mansion House on the day that convertibility to specie was suspended, under the aegis of the Lord Mayor of London. … more than three thousand business men pledged themselves, by resolution, to receive and to make their payments in bank-notes, as equivalent to coin. This show of confidence “tended to restore public confidence”. At that point, as Britain had entered the period now known as “The Restriction”, it was necessary for “Parliament … note merely to legalize the act, but to establish a status for the new condition of the Bank”. The result was the Bank Restriction Act 1797 (the “Restriction Act” was passed in June, which formalised the abandonment of convertibility and prevented the Bank of England from becoming insolvent. This established a fiat currency system. It meant that the banks of issue (local banks) outside of London were required to redeem their own banknotes in the form of the now non-convertible Bank of England notes. 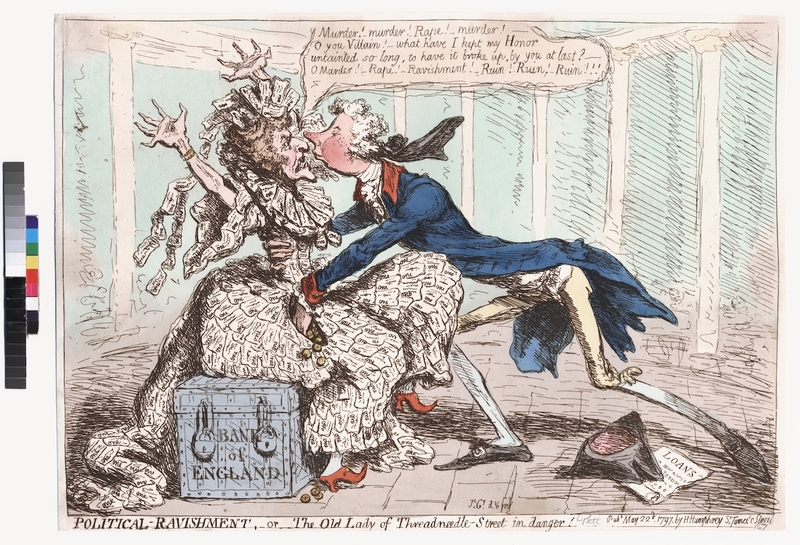 The cartoon showing the Bank of England as the “Old Woman of Threadneedle Street” by James Gillray was published on May 22, 1797 by H. Humphrey of St James Street in London. Hannah Humphrey put the print on show at her shop in St James “where passersby would cluster around the windows to view the latest scabrous jokes” (Source). Click it to see a larger version. A very large version (20.8 mg) with more about the historical context of the cartoon is available HERE. The outcomes from the Restriction were soon observed. 1. “It had been proved that bank-paper did not depend for its credit merely on its convertibility” – that is, its specie backing. 3. Prior to the Act, banknotes had to be at least of 5 pounds in value. But “Under the new state of affairs this prohibition was removed, and notes of one and two pounds began rapidly to drive gold from ordinary use.” This was largely due to the shortage of specie, which was still required to facilitate international trade. 5. There was controversy in the early C19th, when the price of gold rose, and an MP claimed that this was due to an “excess of bank-notes”. This view was debunked and “Events soon decided in favor” of the counter-view. As an aside, in the early chapters of my PhD thesis, I studied this debate between Mr Boyd (inflationist) and Henry Thornton (counter view). 6. For many years, Britain enjoyed “the perfect stability of the currency during a number of years when the circulation was still further enlarged”. 7. “If irredeemable government paper had been forced upon the public without regard to its wants, until within a space of two years the currency had swelled from a total of £17,000,000 to one of £24,500,000, it scarcely admits of a doubt that the result would have been a rise in prices and an increase of speculation. According to all the old currency theories, such ought now to have been the case with England. In fact, directly the contrary result took place”. 8. During the restriction period, the wars raged and after Napoleon was defeated there was a deep recession. But none of that can be attributed to the Bank Restriction Act. As the 1867 article recognised “it is impossible to deny that the violent convulsions of 1815 would have proved too severe a tiral for any but the most elastic form of credit” (referring to the inconvertible paper system in place). The equilibrium was therefore restored, and it was restored without interference by government. The system vindicated itself, and is justly entitled to the high creit that properly belongs to so brilliant a success. Meanwhile, the economists who were opposed to the Restriction maintained a public hostility to it – similar to the way the mainstream economists today rave on about deficits and public debt. … found in bank paper and its over-issues an explanation for every rise or fall in prices, and for every financial disaster. They were not convincing, given the historical facts. From the The Maddison-Project, we learn that the two powers at the time of the Restriction were Britain and the Netherlands. 2. By the turn of the century (1800), Dutch GDP per capita had risen to $2,609 (11 per cent rise), while Britain recorded $2,097 (24 per cent rise). British GDP per capita rose faster in the quarter of the C18th than earlier. 3. Dutch GDP per capita fell on hard times and was overtaken by Britain around 1808. 1. GDP growth accelerated in the Restriction period compared to the 90 years previously. 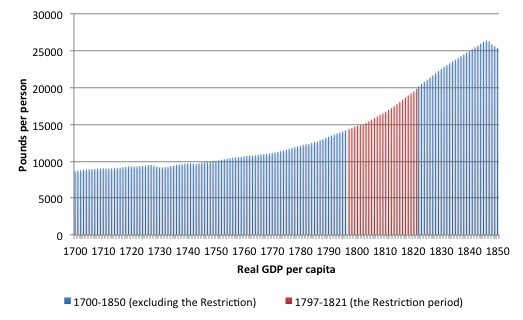 The following graph shows real GDP per capita between 1700 and 1850 in Britain, with the Restriction period shown in red. The results speak for themselves. Not only did Britain become the strongest economy (usurping the Netherlands) but it delivered real per capita income growth consistently throughout the period of the Restriction. I won’t go through the details of the rise of the conservative Robert Peel (who was opposed to the Restriction) and repealed the Act in 1821 and pushed Britain back onto a convertible Gold Standard. He claimed that “The Restriction had been a war measure merely” and in times of peace it was essential to return to convertibility. Every government loan had been raised on the faith of these pledges; the interest of the national debt had been paid in paper, on the ground of its equivalence to gold; every public or private debt since 1797 had been contracted under the influence of acts of Parliament prescribing the time of resumption ; every Bank note bore a promise to pay upon its face. Four years had already been allowed to pass, and nothing had yet been done. It was felt that any further concession either to public timidity or to class interests would endanger the national credit, if indeed it did not proclaim a criminal dishonesty in those to whom the duties of legislation were intrusted. But in reality he was opposed to the fiat monetary system for the same sort of reasons that mainstream economists oppose what we call Overt Monetary Financing, which effectively is what the Restriction created. Britain then struggled with the Gold Standard on and off for many years and was even seduced into joining the Exchange Rate Mechanism with European countries before the disastrous Black Wednesday (September 16, 1992) saw it float for the last time. It is always good to reflect on history and to really sort out what happened as opposed to the revisions that are made by those pushing ideological agendas. In this context, I note that OMFIF (Official Monetary and Financial Institutions Forum is holding a public event on December 8, 20165 in London – When Britain Went Bust. This is a private organisation which claims to be advised by economists of repute and all its meetings are in camera. You can bet the orthodox lies about the 1976 IMF hoax in Britain will be entertained in full at this secret gathering. To help indoctrinate the next breed of policy makers etc. A few paragraphs in: ‘the period between 1973 and 1821’. I’m sure you mean 1797. Thanks as always for passing on your knowledge Professor. narrow the gap in incomes which makes them wealthy and powerful. of Trump Farage and Le Pen .No more Mr nice guy but the plebs will still be kept in their place. Didn’t Britain also suspend the gold standard in WWI? An then again during the Depression? Didn’t the Americans, that is, the North also suspend the gold standard during the war against the Confederacy? It seems that during a war, governments are prepared to do what they refuse to do in peace time. Didn’t Pitt’s taxation reforms also lead to the introduction of income tax into the UK. I suppose The Bank (independent /private) was giving the government a hard time. However I’ve seen it said The Bank was main reason for the defeat of Napoleon. Yes, widening the gap between the incomes of the elites and the masses makes the elites relatively richer, and thus actually more powerful. But even that is not enough when a society becomes increasingly wealthy. Someone still has to do the work that produces wealth, and for that you’ll need shortages. Even if you have to manufacture them. Perpetual wars (on terror !!!) do this well. So does keeping the number of doctors lower than what the population needs. And of course, ruining the supplies of potable water (#NoDAPL) while cornering the rights to what remains (Nestlé’s). Ah, what the rich will do to enslave the masses. Can someone please help this Reddit User with some questions regarding MMT? City Lectures are delivered by leading policymakers to high-level audiences in London. Since 2010 there have been 80 City Lectures with high level speakers from 29 countries, including 28 governors from 22 central banks. discussion. A reception will follow. Not quite on topic, but concerning the Bank of England, I notice that Mark Carney has been demonstrating his “independence” again, by taking pot shots with his peashooter and catapult at the government, complaining about lack of clarity on Brexit, and warning that (I think this is the way he put it), the fiscal deficit would not be big enough to support the trade deficit (interesting that that connection was made). I heard that on the radio tonight, although the BBC is taking another angle on its web site, namely high consumer debt, which admittedly, is a serious issue. In 1833 as part of the abolition of slavery the British Government agreed to compensate slave owners for their loss of ‘property’. Yes you read that right slave owners were compensated not slaves. To use the term common in the UK today the sums involved were ‘eye watering’. The national debt was increased substantially to pay for it. The National Debt Office of the Bank of England was involved. Much work seems to have recently been done on who owned the slaves and what they did with the compensation money. It’s possible the money financed a number of developments in the late industrial revolution. It would certainly have provided a significant fiscal boost. There have been times in the past short of war where the UK Government wasn’t too worried about ‘fiscal space’. The really interesting thing is that by the end of the second decade of the nineteenth century, British national debt to real GDP exceeded 2.5. In addition, the Government spent much of the Napoleonic Wars buying up labour, capital and raw materials in a growing military industrial complex. The naval dockyards were a hub of productive activity. One wonders why the Industrial Revolution wasn’t “crowded out” by all this public debt and demand for resources as the orthodoxy economists would have predicted. Thanks for your comment and help. As you know, this period was when the industrial revolution accelerated and England boomed. It really upsets the mainstream neo-classical narrative. But then there are countless examples in history that confirms the lack of veracity of that particular theoretical approach.